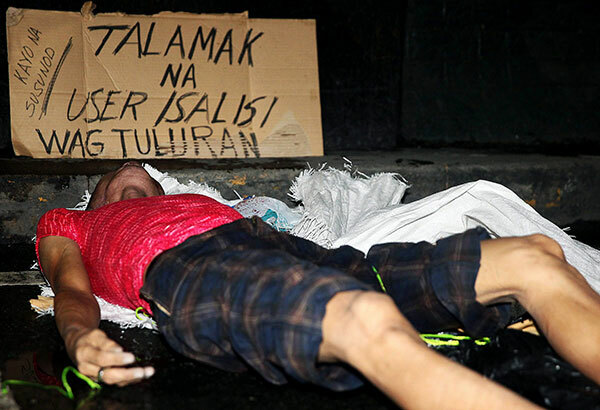 Victims of Duterte’s “war on drugs”. Trump’s invitation to Philippine president Duterte is a warning for what he (Trump) has planned for the black communities in the US. So far, he’s proceeded a little cautiously on that front, preferring to focus his attack on those who are a little more vulnerable first, like undocumented immigrants. But in racist America, it’s always going to come down to attacking the black community. What does Duterte have to do with it? In his announcement of his invitation to Duterte, he praised the Philippine president for “trying to rid his country of drugs”. And what does the war on drugs, Philippine style, mean? Thousands of extra-judicial killings. Masked me on motor cycles – cops in disguise – driving up to the suspect, taking him out in the streets and gunning him down in cold blood. They even have a special word for it: “Nanlaban”, meaning “he fought it out”. (In the US, the term is “resisting arrest”.) 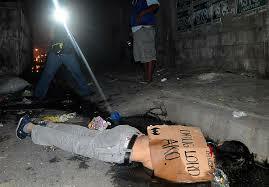 A recent New York Times article quotes a police chief saying that there is a new way of dying in the Philippines. Then he holds up his hands, wrists together as if they were in handcuffs. This police chief is openly bragging about the murders being carried out by his cops. In the US, the cops might proceed a bit more cautiously at first. But given the impunity with which they beat, falsely arrest, plant “evidence” and outright murder people, most especially black people, Trump’s invitation to Duterte should stand as a most serious warning.